A PVC fence and be happy that you did! We, at Gold Coast Hurricane Shutters and Fence, will give you a solid privacy fence, or a modern design which allows the wind to pass through; the choice is yours. We have mastered many different types of PVC fences, and have a variety of options available to you. We pride ourselves on complete customer satisfaction. We are the preferred manufacturer of excellent PVC fence for residential and agricultural purposes. We directly manufacture all of our goods, meaning you get it directly from the source at the cheapest prices possible. Take advantage of our good prices and our expertise. Call today! Your maintenance free PVC Fence is ready for installation, shortly after you get your order processed with our Gold Coast experts. We look forward to providing your fencing needs for many years to come; we stand behind everything we do. Fence contractors and fence companies, serving Broward, Palm Beach and Miami-Dade Counties all prefer Gold Coast fencing products, and so would you! We use rigid PVC material containing potent impact enhancers, which give greater strength to the entire fence. The Gold Coast PVC Fence will never fade or turn yellow; you will get compliments as the property will take on a fresh charming look with our creatively designed fence. PVC fence can be simple and sturdy as well as classy and elegant. It can be easily shaped into a variety of different styles, giving you a more modern look. We will tailor you order to your exact specifications, so that you are completely satisfied with our work. Our PVC fence is the best in the business. 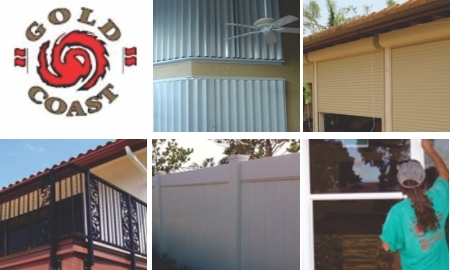 We hold ourselves to high standards at Gold Coast Hurricane Shutters and Fence and deliver goods of only the utmost quality. For all your hurricane protection, aluminim and PVC fencing needs, call Gold Coast today for a FREE consultation.